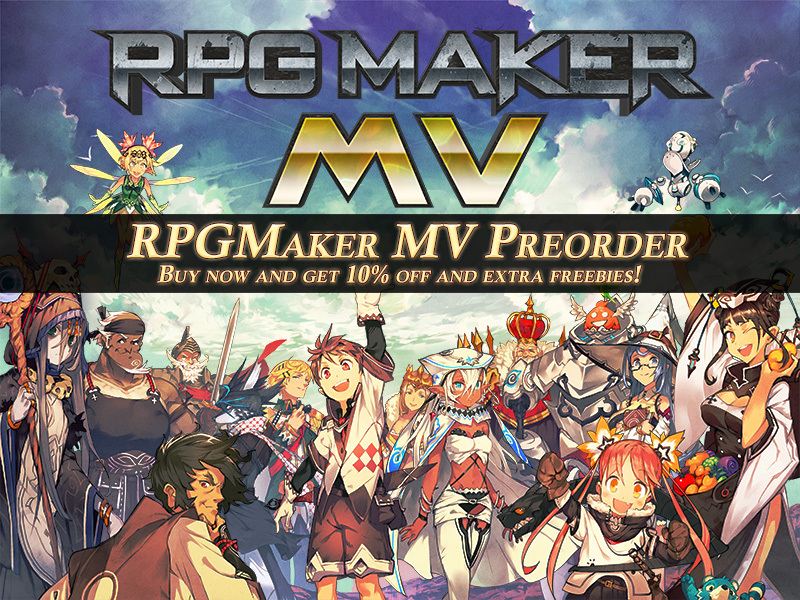 If you haven’t seen it yet, pre-orders are available at RPGMakerWeb. It is priced at 79.99 but if you pre-order now, you can get 10% off! Just click on the image below! With the announcement of RPG Maker MV’s release date coming up on October 23, 2015, I will be migrating to the new engine as soon as it is available. As a result, I will focus less on Ace and more towards MV. I will continue using this website to post any new works, with a separate section for MV scripts. However, this does not mean all Ace scripts will be abandoned! I will continue to provide support for existing Ace scripts. As usual, just leave a comment on the script page, Facebook, or Twitter; use the issue tracker; or use the contact form to send me an email regarding any issues. Wondering whether you can use my scripts in MV? From my experience with Ace as well as the previews shown over the past few weeks for MV, I am pretty sure there will be a lot of functionality that still won’t be provided out-of-box. Over time, I will be porting over scripts that I think would be useful for development, and writing new scripts since the new script system is much more open than before. If there are any scripts that you really want to have in MV, just send me a message on Facebook, Twitter, on my request/issue tracker, or the contact form. Sounds awesome hime! I’m pretty excited for MV, hope it opens a lot of new possibilities. Also, figured I’d post a comment because I read a lot of your updates but rarely every comment. With the new browser capabilities, I’m looking forward to a new way to present scripts. Next story Is RPG Maker MV Over-Priced?